Having crossed the footbridge over the ‘urban motorway’, you are now in Woodhouse Square, part of the small but genteel settlement of ‘Little Woodhouse’. In the late Georgian period this was part of the failed attempt to develop a genteel ‘west end’ in Leeds. Unfortunately this was thwarted by the smoke from factory developments along the river Aire further to the west - perhaps explaining why Heaton became an early anti-smoke campaigner! Some of the elegant Georgian buildings to the S. of the Square (numbers 5, 6 and 7) which now house Swarthmore Education Centre, once belonged to Heaton’s sister, Ellen. A blue plaque commemorates her residence at no. 6 from 1859 to 1894. Ellen was a notable art collector, whose collection of pre-Raphaelite paintings is now housed at Tate Britain, London. She was a correspondent of the art critic, John Ruskin, who encouraged her interest in the work of Dante Gabrielle Rossetti and Arthur Hughes. 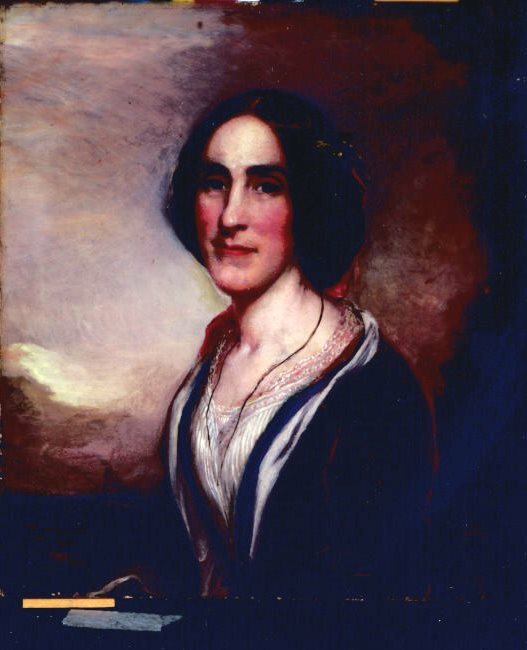 She also became a friend of the poets Christina Rossetti and Robert and Elizabeth Barrett Browning, though Elizabeth’s letters make some snobbish references to Ellen’s provincial accent and manners. The rental values of Ellen’s properties allowed her to live a life of leisure split between Leeds, London and Italy. Some of the artworks Ellen commissioned can be seen online at Tate Britain. Heaton was sometimes scathing in his diaries about Ellen’s pretentions, and her obsession with meeting famous people, wryly describing her pursuit of the royal party at the International Exhibition, Kensington in 1871 (Journal, iii. 192-4). There is no doubt that she cut an increasingly eccentric figure in Leeds, but thanks to her feminism and philanthropy she is justly remembered as one of the pantheon of ‘Leeds Heroes’ in an interactive display at the City Museum, where her portrait also hangs. In many ways her reputation has outlived that of her brother. The fact that Ellen’s old home now houses part of the Swarthmore Education Centre is very fitting given her activities as a patron of the arts and her work for women’s education. Beresford, M. (1988), East End, West End: The Face of Leeds During Urbanisation, 1684-1842. Leeds: Thoresby Society. Hardman, M. (1986), Ruskin and Bradford: An experiment in Victorian cultural history. Manchester: Manchester University Press. Payne, D. (1995), ‘Ellen Heaton’, The Dial, 4. Surtees, V., ed. (1972), Sublime and Instructive: Letters from John Ruskin to Louisa, Marchioness of Waterford, Anna Blunden and Ellen Heaton. London: Michael Joseph.